A steady favorite since Oceana was first built, the Thursday coffee hour provides the opportunity for friends and neighbors to visit over a cup of coffee or tea and pastries and enjoy the week’s program-from belly dancers to high school choirs to informative presentations by community organizations and leaders. Newcomers are always welcome. 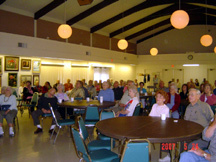 Coffee Hour is 9am every Thursday in the Clubhouse Auditorium.